Ok, so technically we didn’t run. We took a bus. An old, well worn bus that wound its way back and forth around seemingly endless switchbacks for the 130km trip from Kochi to Munnar. As you might expect, travel here does not take place at lightening speed. The trip took about 5 hours, and the bus was akin to the tin can I would take about 7 km to my site in Paraguay. Not something you would expect to travel on several hours. Nonetheless, we had a place to sit down with no persons or animals on top of us or squeezed in beside us. Oh, and it cost $1.60. I won’t complain. As you’ve probably gathered from our posts, it’s rather steamy here. 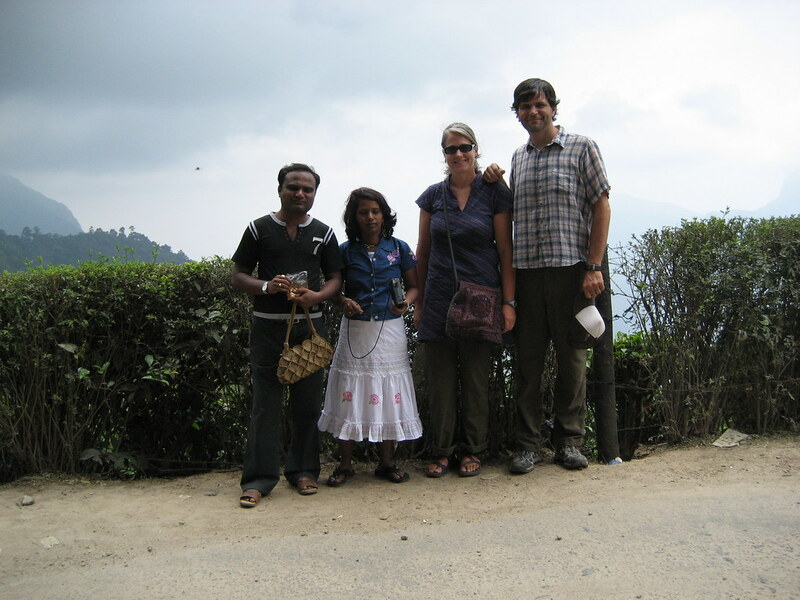 So much like the British back in the day, we were ready to head for the hills – specifically the hill station of Munnar. The area is surrounded by surprisingly beautiful tea plantations. Munnar itself is somewhat of a company town. Though there are other estates in the area, Tata Tea seems to be the big daddy. The beautiful new school down the road bears a striking resemblance to the corporate headquarters of Tata Tea. While there are handfuls of foreign tourists around, most of the tourists are Indians and the town is apparently especially popular with the honeymooners. It’s been a learning experience for us. Today we took the Munnar Dept. of Tourism’s Tea Valley Tour. Much to our surprise, we were in the minority. Aside from two Spanish women (which whom we would eventually commiserate), all the folks on the tour were Indians – including at least one couple on their honeymoon. Fortunately, we were able to see some of the natural beauty of the area, but with every stop we were affronted by people trying to sell all kinds of random crap (like a stuffed florescent green monkey) or charge additional money for things we have no interest in doing (like riding in a speed boat around a lake for 15 minutes), though the locals certainly did. When the bouncing of the mini bus on the winding road and the honking horns of oncoming traffic weren’t enough entertainment for us, we also had the never ending sample of ring tones from our fellow passengers. (They really, really love their ring tones.) I imagine they are still baffled as to why the we ditched along with the Spanish women before the last stop on the tour.